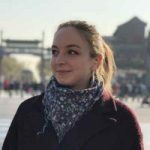 Coming to Beijing and looking for something to do free or cheap in Beijing? Beijing is quickly becoming one of the most popular tourist spots to enjoy the cherry blossoms in China, and with good reason! 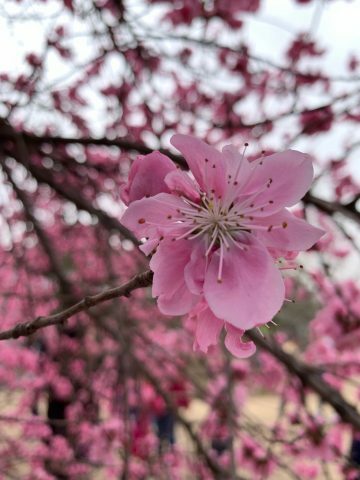 Aside from the view from your window down at your apartment complex’s gardens, there are numerous places to enjoy the blooming of the many different types of blossoms throughout Beijing. After a long and largely lifeless winter in Beijing, entering springtime brings a new lease of life into the city. Beginning at the end of March and lasting throughout April and into May, the city brightens up to showcase a beautiful array of flowering blossoms. Despite the random snow that descended over the city during the start of April, spring is finally here. Before getting stuck into the list we just wanted to make you aware of a phenomenon that seems mainly reserved for China. 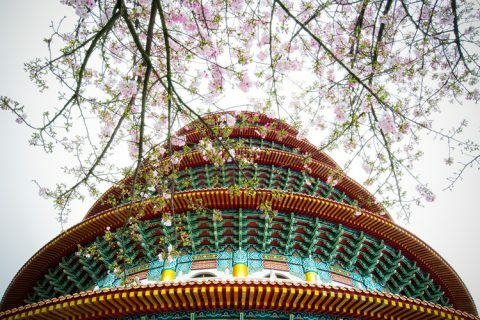 Here’s our list of the 6 best places to enjoy the Chinese cherry blossom festival season in Beijing. In the Temple of Heaven, there are 240 clove trees that line up to create a sea of color. You can find them near the Hall of Prayer. Head to the popular Summer Palace in Beijing towards the end of March or beginning of April. 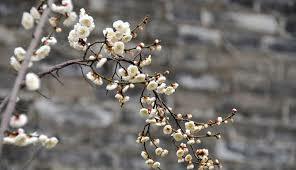 This is definitely the best time to visit, as you’ll be hit by the beautiful fragrance produced by the Magnolia trees. Not only that but the Temple of Heaven and Summer Palace are two of Beijing’s finest sites all year around. Alongside the Badaling Great Wall stretch, you’ll find large fields of Apricot trees that brighten up the landscape. Combine a trip to the Great Wall with a bit of blossom viewing and you’ll have the perfect combination of tourist attraction and nature enjoyment – plus, it makes those pictures that more Instagram-friendly. 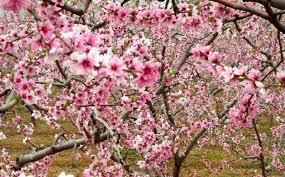 As soon as Beijing begins to warm up, the peach blossoms at the Beijing Botanical Gardens start to blossom. Thousands of peach trees line up to create an endless sea of colour, and with over 70 varieties of peach trees each with their own unique character, you definitely won’t get bored of the sight of them. 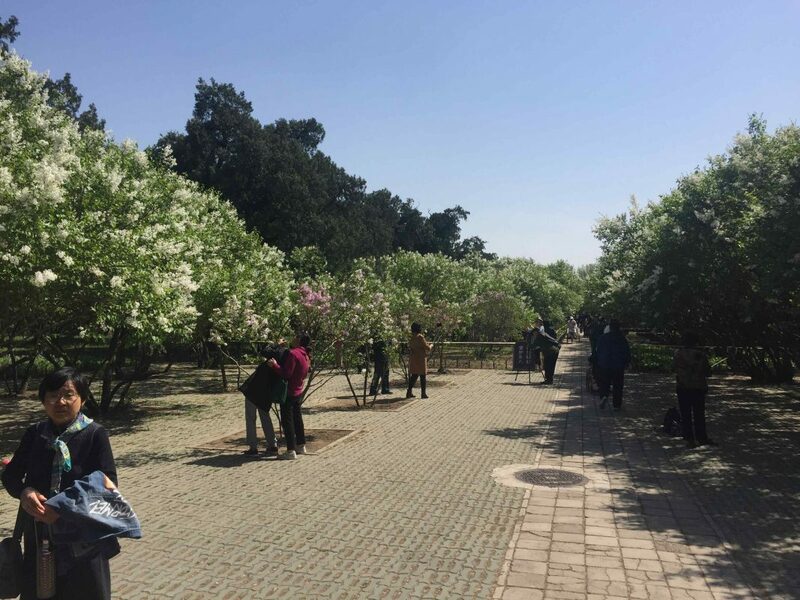 The botanical gardens boast the largest peach blossom garden in the whole of Northern China, located just outside of the centre of Beijing. The Beijing Peach Blossom Festival is also held in these gardens – although the exact date of this festival varies annually. So, if you haven’t taken a trip to the botanical gardens yet – now is your perfect chance! Pinggu in Liujiadian County lies about 40 miles (70km) northeast of Beijing – but with over 6,000 hectares of peach groves, it’s definitely worth the trip on a sunny day. 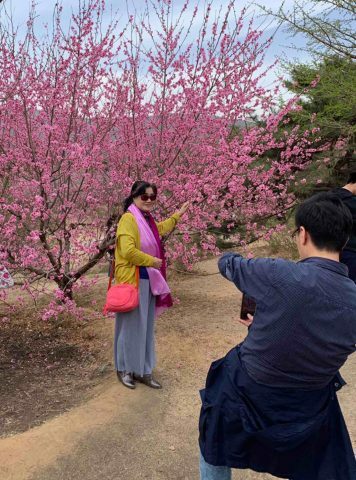 Pinggu offers something for all the senses; take a stroll through the groves and enjoy the powerful fragrance surrounding the area or have a picnic and enjoy picking and sampling your own peaches. All whilst surrounded by what is said to be the largest peach grove area in the world. Escape the hustle and bustle of China’s capital city, Beijing, and go to Jingshan Park for a piece of bliss and serenity amongst the otherwise crowded and noisy city center. Jingshan Park is located just North of the Forbidden City. It is a perfect place to relax. 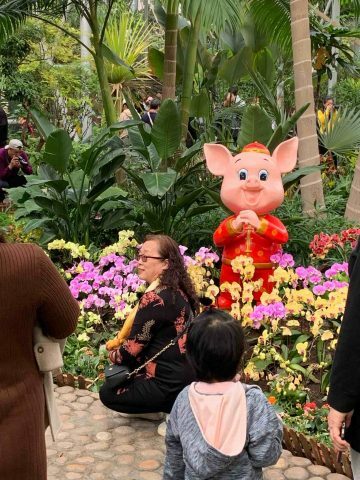 Every year the city holds its annual Peonie flower exhibition in Jingshan Park – which showcases the biggest collection in the whole of Beijing. This has been a tradition since the Yuan Dynasty (1271-1368). 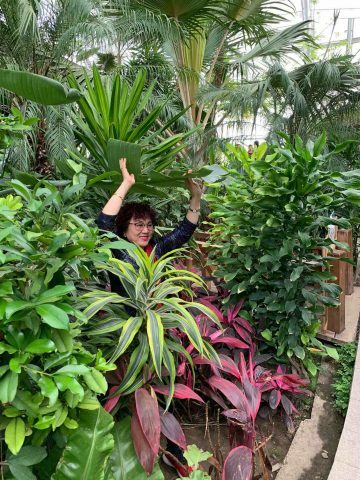 As well as the 30,000+ peonies and 200 varieties to enjoy, you will also be able to enjoy the site of the many locals that come here on a daily basis to practice tai-chi, dance, or just take a walk. Yuyuantan Park is probably one of the most famous places in Beijing for enjoying cherry blossoms in China. 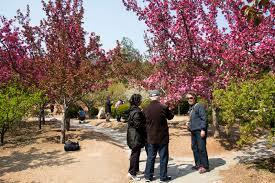 It has the largest collection of cherry trees in Beijing (over 2,000) and the gardens themselves are stunning. 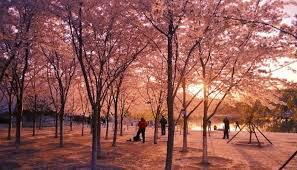 Here you will also find the Yuyuantan Park Cherry Blossom Festival – run by Yuyuantan Park. This is the largest festival of its kind in northern China, and it attracts people from all over the world every year. Aside from the Cherry Blossoms, the park has many attractions that make it fun for all the family. So whether you have kids or you are a big kid yourself, you won’t run out of things to do here!